It is the phenomenon of water flow through a semi permeable membrane that blocks the transport of salts or other solutes through it. Osmosis is a fundamental effect in all biological systems. It is applied to water purification and desalination, waste material treatment, and many other chemical and biochemical laboratory and industrial processes. When two water (or other solvent) volumes are separated by a semi permeable membrane, water will flow from the side of low solute concentration, to the side of high solute concentration. The flow may be stopped, or even reversed by applying external pressure on the side of higher concentration. In such a case the phenomenon is called reverse osmosis. If there are solute molecules only in one side of the system, then the pressure that stops the flow is called the osmotic pressure. Reverse Osmosis (RO) was invented in 1959 by Prof Reid of the University of Florida, and was put into practical use by Sidney Loeb and Srinivasa Sourirajan. It is a process which removes both dissolved organics and salts. Feedwater is pressurized and flows across a membrane, with a portion of the feed permeating the membrane. The balance of the feed sweeps parallel to the surface of the membrane to exit the system without being filtered. The filtered stream is the permeate, because it has permeated the membrane. The second stream is the concentrate because it carries off the concentrated contaminants, rejected by the membrane. Because the feed and concentrate flow parallel to the membrane and not perpendicular to it, the process is called �cross flow filtration�. 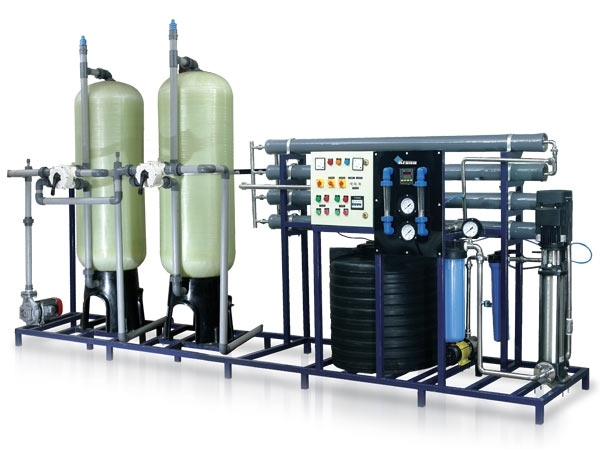 Depending on the size of the pores engineered into the membrane, cross flow filters are effective in the classes of separation known as Reverse Osmosis, nano filtration, ultra filtration and micro filtration. RO removes most organic compounds and up to 99% of all ions. A selection of RO membranes can be used to treat different feedwater scenarios. It can meet almost all water standards with a single pass system and all water standards with a double pass system. The process achieves rejections of 99.9% of viruses, bacteria and pyrogens. Pressure in the range of 3.4 � 70 Bar is the driving force of the RO purification process. It is much cheaper than most conventional treatment systems today, and with GrahamTek Proprietary technology, removes the need for pre-treatment chemicals.